Earth’s experience of different global climates emerges from a patchy record of extremes. There have been times when ice built up on land to form the distinctive rocks laid down by glaciers. Equally, coal deposits extending almost to the poles in the Cretaceous Period, when signs of continental ice are absent, signify a time of considerably warmer conditions around 125 Ma ago (Chapter 7). There seem to have been two extreme states for global climate, expressed graphically as ‘icehouse’ and ‘greenhouse’ conditions. Although the Sun’s energy output has increased gradually since it formed, there are no known astronomical mechanisms, such as the Milanković cycles (Chapter 4) that explain this long-term, two-fold climatic signature as anything other than a product of our planet’s own behaviour. Building up a history of changing climate relies on many strands of evidence, some from signs in sediments of particular environmental conditions in which temperature plays a major role, others that measure temperatures in a more or less precise way. En route to explaining climate shifts, the evidence needs to be placed in a geographic context – the ancient latitude of the investigated sites, the position within continental assemblies of evidence that accumulated on land, and the water depth of that from marine rocks. There is also the matter of geological context. What was going on at the time in terms of volcanic activity, of living processes and the burial of their remains by sedimentation? One climate forcing is that connected with the carbon cycle and the ups and downs of CO2 in the atmosphere. Broadest of all are the continually changing disposition and shape of land masses, since they modify the circulation of ocean currents and winds together with their redistribution of solar energy from latitude to latitude, as you saw in Chapter 16. Of all the sedimentary indicators for climate, glacial deposits are the most crucial because they signify that where they accumulated water vapour had fallen as snow at a faster rate than it melted. If they are widespread and extend to former sea level that implies generally cool global conditions. Glacigenic sediments are distinctive, simply because they contain such a jumble of fragment sizes (Figure 17.1a), and because rock fragments in them are often erratics that are exotic compared with those occurring locally. Ice transports everything moveable, and it does so up to hundreds of kilometres from their source. But there are other processes that can mimic this jumbling, such as gravitational collapse of unstable slopes and even asteroid impacts, so we need a unique set of properties to properly confirm glacial action. In their absence, sediments made of mixed jumbles are referred to using the neutral term diamictite. If large fragments have deeply grooved faces from their being scoured across the rocky surface beneath ice, or if the surface on which they rest is similarly grooved, such features seemed until recently to prove beyond question a glacial setting. But impact craters and their ejecta, in the light of the Apollo revelations, show very similar features in rocks moved by the blast of collisions. The key to identifying such ‘ringers’ for glacial tillites is their content of melt rock and shocked minerals. Figure 17.1 Examples of probable glaciogenic diamictites from the late Precambrian of Scotland. (a) A possible tillite with a large range of fragment sizes and compositions (basalts, gneisses and granites that do not occur in older rocks of the area); (b) A dropstone that has punctured sedimentary layers and deformed those beneath it. Glacial debris on land is unlikely to linger, because it soon succumbs to erosion once conditions warm up. Much more durable are those products of melting ice that find their way to the sea floor from ice shelves that float at the margins of glaciated continents. A continuous supply of glacial debris builds thick sediment piles so quickly that they assume insupportable slopes. Jumbled slurries rushing to deeper water as turbidity flows become layered and more uniformly sorted by this secondary means of transport. Geologists might easily mistake such glacio-marine sediments for the products of turbidity flows unconnected to climate shifts. The key to a glacial link is quite simple. Floating glacial ice charged with debris drops fragments to the sea floor. As they slap into accumulated sediment, they puncture its layering to appear as dropstones (Figure 17.1b). Again there is only one other process that could mimic such a feature – the infall of impact ejecta. The problem, as you will guess from Chapter 10, is that it may well have happened somewhere and at some time in the geological record. In fact, a few ancient strata once called ‘glacio-marine’ have proved to be ejecta from giant impacts, but the vast majority have no such connection. Despite these caveats, tillites are prime sedimentary indicators of global climate and have been since Wegener’s first use of them for such a purpose (Chapter 2). The others that he used to support his reconstruction of Pangaea are misleading without other kinds of evidence. Continental sediments that witness aridity, such as sands bedded in dune forms that can only result from wind action, form today over a great range of latitudes. All that is needed is wind, lack of moisture, or rapid evaporation of that falling as rain, and an absence of the soil-binding action of plant roots. Deposits of salt also mark greater evaporation than precipitation, some lakes above the Arctic Circle are highly saline and precipitate salts such as sodium carbonate because the boreal air is so dry. Many thick salt deposits do not form at the bottom of enclosed seas subject to intense evaporation. Instead they form in muddy sediments at the coastal fringe when evaporation from their exposed surface draws in salty water through deeper sediments. Crystals grow and grow from the continual supply. Coal deposits clearly represent high plant productivity and the trapping of woody debris in subsiding sedimentary basins; in other words swampy forests. Yet that does not demand tropical rain forest. If plants have sufficient moisture, nutrient and sunlight to convert CO2 and water to tissue potentially they know no limit of latitude; the crucial conditions for coals to form are preservation of plant tissue from oxidation and rapid burial by other sediments. Most sedimentary climate indicators are only useful by knowing the latitude at which they formed. Given enough sites, palaeoclimatologists can reconstruct climatic zonation on former continental assemblies to judge its relation to global conditions, which was Wegener’s stroke of genius. Limestones are useful for studying past climate in another way. The abundance of limestones of all ages and knowledge of the latitude where they formed show that most of them, however they were precipitated, mark once low latitudes. The role of living processes in carbonate deposition, clearly shown by fossils in Phanerozoic limestones and the near certainty that blue-green bacteria triggered Precambrian carbonate precipitation, suggests why the rule of thumb is probably correct. Marine life depends on photosynthesis, and most sunlight is available in the tropics. So, abundant limestones are key indicators of tropical marine conditions, whatever the global climate. It would be handy if the geologist’s toolkit included a reliable palaeo-thermometer to judge climatic conditions. There is one, but it is useful only for estimating the temperature at which marine animals incorporated bicarbonate ions into their carbonate skeletons. It is based on the control of water temperature over the proportions in which organisms extract the two main isotopes of oxygen from seawater (below and in Part VII). Because ocean-floor sediments contain the most useful fossils for this approach, those of single celled plankton, oxygen-isotope measures of past temperature go back only as far as the age of the oldest ocean floor, about 200 Ma, but reliability falls off beyond 125 Ma ago. There is another set of snags; the measurements relate to the water in which a shelly organism actually lived, not to average global surface temperature. The temperature of bottom water is often very different from that at the surface, and the actual temperature of both may fluctuate because of currents. Even bottom water, which should be more stable, poses problems. Sometimes the deep flow shuts down for long periods, isolating ocean-bottom water from climatic fluctuations. When it is flowing, it is cold, by virtue of its origin in polar regions (Chapter 2). Its temperature even under the most favourable conditions hardly fluctuates. Later in this Chapter you will see how oxygen isotope variations provide general indications of the course of climate since the mid-Cretaceous. In Part VII you will see how oxygen isotopes from marine sediments do reflect global climate, by varying not so much with temperature but with how much water is extracted from the oceans to become locked on land as ice caps. Our scope here spans the whole of recorded geological history, and different approaches apply to different times. For the Precambrian the focus is on unusually cold epochs, when CO2 levels in the atmosphere were sufficiently high that for much of the time the Earth would have been a generally warm place. About 400 Ma ago living processes began to accelerate the withdrawal of the main ‘greenhouse’ gas to long-term geological storage. Subsequent climate history is roughly equally shared by ‘greenhouse’ and icehouse conditions. Much the most important part of that long fluctuation is how climate was triggered to deteriorate to the icehouse epoch that characterised our evolution, an oddly warm part of which we now inhabit. Dividing up the Precambrian into relative-time zones is still not easy, despite radiometric dating. Historically, geologists have used bouldery sediments or conglomerates, as major time divisions. This is because many represent periods of tectonic activity, uplift and erosion at unconformities. They are difficult to overlook, provided exposure is good. Coarse rocks with a glacial origin are spectacular examples, often accompanied by other distinctive sediments, such as those with fine laminations laid down seasonally beneath open and frozen water, which may contain structures formed by large ice crystals. If tillites existed in the Precambrian then geologists would quickly find them, and they did. Put into a time frame by radiometric dating, they occurred in three main pulses (Figure 17.2), one around 2200 Ma (Huronian glaciation) and two younger pulses, lasting from 717 to 660 Ma (Sturtian) and from 640 to 635 Ma (Marinoan). There are tillites even in the Archaean at about 2900 Ma, but they are not widespread. The 2200 Ma evidence for glaciation comes from wide tracts in Ontario and Wyoming, and from southern Africa. That from the latest part of the Precambrian crops up on all continents, and in places those glacial deposits are the thickest known. For a world with a more effective ‘greenhouse’ atmosphere than that of more recent times, it is odd enough to find signs of frigidity. Studies of silicon and oxygen isotopes in silica-rich chert from Precambrian sedimentary sequences suggest average sea-surface temperatures declining from about 70°C at 3.5 Ga, through 50 °C at 1.9 Ga to between 30 to 40 °C at 542 Ma, the start of the Phanerozoic. What is truly startling about the Precambrian examples of glaciation was first suspected when it was found that all lie directly beneath limestones; so-called ‘cap carbonates’. Might that signify substantial ice masses in the tropics? The key to the global position of the Precambrian glaciers is the palaeomagnetic pole position (Chapter 5) associated with each of the tillites. Some of the palaeopole positions indicate latitudes within what would be the present day tropics. Yet the maximum southward extent of Northern Hemisphere continental ice caps at the coldest time of the current glacial epoch was about 40°N. Extensive glacial in the Precambrian tropics is hard for us to believe. Might the glaciers have formed just in high mountains, like modern examples in the tropical Andes and on Equatorial Mount Kilimanjaro? That idea is easily refuted, for many of the Precambrian low-latitude glacial deposits are submarine diamictites containing dropstones. For such sediments to form, glaciers must have reached sea-level to float as thick ice shelves, as happens today around Antarctica. Is there some error in the palaeomagnetic data? To find igneous lavas with irrefutable paleomagnetic indications of latitude interbedded with sediments is a matter of luck. Some of the palaeolatitudes are from igneous rocks separated from the tillites by thick rock sequences. Continental drift may have taken high-latitude lands closer to the tropics in the intervening periods, or vice versa. A few tillites from each main glacial Precambrian epoch, for instance in Australia for the late-Precambrian and South Africa for the 2 200 Ma glaciation, do envelop or directly underlie lavas. In both cases low latitudes are confirmed, at about 5° and 11° respectively. As more data emerge the case for global ice cover grows stronger. So far, little evidence for repeated glaciation interspersed with short warm periods – a characteristic of later glaciations at high latitudes – has been discovered in the ancient cases. It seems distinctly likely that the Earth was plunged into globally frigid conditions three times, before life really got a hold on the removal of CO2 from the atmosphere. How long such global frigidity may have lasted emerged from an imaginative geochemical study. If glacial ice endured for millions of years, constantly falling meteoritic material would have become trapped in it. That has happened in the modern Antarctic, which has become the place for meteorite specialists to visit and make collections. A rock core drilled from sediments at the interface between Precambrian glacial diamictites and their overlying ‘cap’ carbonates in central Africa were analysed for the element iridium, known to be abundant in meteoritic material. The core contained a prominent iridium ‘spike’ at the very base of the carbonates. Such an anomaly might be ascribed to a meteorite impact, but in this case the coincidence would be too good to be true. The geochemists used its magnitude to estimate how long cosmic dust would have had to accumulate in ice to build up such a high Ir level if it was released by melting. Using the accumulation rate of cosmic material in modern sea-floor muds gave a total accumulation time of around 12 Ma. Accepting that such global icehouse conditions did form, and leaving aside how that might have happened, they pose another major conundrum. Swathed in ice, a ‘Snowball Earth’ would be locked into frigidity because ice would reflect a great deal of incoming sunlight back into space. Emergence from icy conditions seems difficult to achieve The most likely way would be release of CO2 through volcanic activity during a time when there was insufficient photosynthesis to draw-down the atmospheric carbon content, which might slowly build up ‘greenhouse’ conditions. Other possibilities are: an upsurge in sea-floor spreading or a major continental flood-basalt event. So far, evidence for the last two has not emerged. However, an even greater problem is how the Earth might have been plunged into such a frigid state to trigger low-latitude glacial processes. Explanations split into those invoking astronomical peculiarities, some that finger the inner mechanics of the Earth and one involving an intimate relationship with life. A suggestion of the first kind is that the Earth may periodically have accumulated a Saturn-like ring of dust by gravitational capture. That would shade low-latitudes from sunlight if it were equatorial. There is very little chance of finding tangible evidence for such a phenomenon. Equally difficult to support with direct evidence is an explanation based on a very different tilt of the Earth’s spin axis. If it was more than 54° then the tropics would receive the least solar radiation. Now that is simple enough to visualise – except for some excellent evidence to the contrary. Closely associated with the glacigenic deposits are banded-ironstone formations that are so beautifully layered that it is possible to detect the effects of much the same monthly tidal cycles as today. They demand an axial tilt more or less the same as now. We can sideline astronomical explanations. As for Earth’s internal processes, the low latitudes for some glacial sediments might conceivably have resulted if glaciation coincided with periods when its magnetic field did not have two distinct poles, or they did not coincide with the geographic poles. Yet, both geological evidence and that from paleomagnetic pole positions coincide at the times of the late-Precambrian glacial episodes to demonstrate that most continental crust was then clumped together, so the geomagnetic field was dipolar as now. We know far less about continental configurations for the 2.2 Ga episode. The magnetic field must have been dipolar, and in the absence of evidence for any shift from its present relation to the spin axis, we have to assume that it was then the same. The Rodinia supercontinent and its successor after Laurentia broke away from it (Chapter 6) have growing support from all kinds of evidence. Continental crust seems to have clustered in the tropics to give a partial ‘ring-world’ (Figure 6.3). Simplistically viewed, that suggests a warmer world (Chapter 16), even for land devoid of vegetation and therefore highly reflective – remember, the Sahara desert is blindingly bright but hot too. The paradox of low-latitude balmy shores nowadays and icy wastes in the Precambrian seems insoluble by purely physical explanations. We have to look to some temporary fall in the ‘greenhouse’ effect, remembering that the Sun has become steadily more radiant with time (Chapter 11), so smaller CO2 draw-downs in the Precambrian would make for quicker cooling. Only life and processes that directly involve the organic world can achieve that. Burying carbon as dead tissue is most easily shown by plotting how the amount of carbon-rich sediment accumulates with time. That becomes less easy further back in time, because sedimentary rocks either become buried beneath younger ones or erosion has swept them away. There is an indirect way, and like the records of continental growth and erosion, limestones provide the evidence. In Chapter 13 you saw that living cells are slightly less able to incorporate the heavier of carbon’s two stable isotopes than the lighter one. The burial of dead tissue in sediments that form under reducing conditions increases the 13C/12C ratio and thus δ13C in ocean water and the atmosphere. That increased ratio would then characterise limestones of the time. The more living biomass there is, the greater the amount of dead tissue that can be buried and the more isotopically ‘light’ carbon is likely to enter sedimentary rocks. Unusually high rates of carbon burial should therefore show as upward ‘excursions’ in a time series for the 13C/12C ratio in limestones and positive values for δ13C. 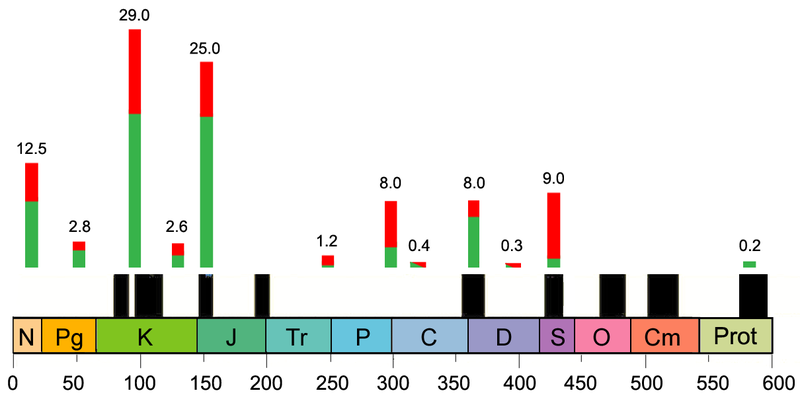 Figure 17.2 charts δ13C in limestones through the whole of recorded geological time. In the Precambrian there are two large peaks preceded by flat trends. The simplest interpretation is that the two peaks represent massive burial of organic carbon. Both Precambrian excursions are associated with evidence for large-scale glaciation. It is difficult to escape the conclusion that Precambrian glaciations are bound up with unusually high rates of carbon burial and therefore removal of CO2 from the atmosphere. For that to happen implies possible explosions in the abundance of life. Whether the earlier epoch coincided with a burst in biological evolution to welcome in the eukaryotes is uncertain, but the later one surely was the harbinger of major changes in the Circle of Life (Figure 14.2), as you will see in Part VI. 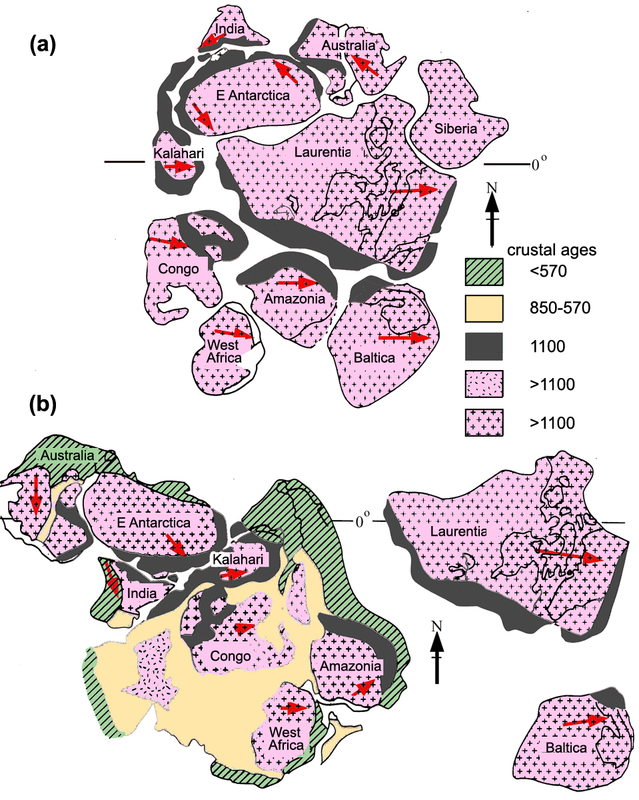 Figure 17.2 How δ13C in limestones has changed through geological history; the pink field shows changes and the range of measured values. Symbols and clusters shown in brown and grey represent sulfur isotope data. The cyan arrows show times of widespread glacial conditions. Details of the last billion years are in Figure 18.1. After Lyons et al. 2014. The critical period during which the eukarya assumed dominance of the oceans is not well defined – their singled-celled ancestors simply do not preserve well. Scanty and debateable as it is, the crucial evidence is that which signals the appearance of enough oxygen in the atmosphere to affect the oxidation state of iron in sediments formed on land (Chapter 8). Abundant continental redbeds, coloured by ferric oxide, enter the rock record after about 2.0 Ga, but fossil soils that supposedly show the onset of atmospheric oxidizing conditions go back to 2.2 Ga. It may be a coincidence, but the correlation between evidence for free oxygen gas, the earliest bump in the carbon-isotope record and low-latitude glaciation at around that time is irresistible. Only eukaryotes seem capable of exploiting the full freedom of the oceans as self-mobile plankton. Colonisation of the top few metres of the world’s oceans, well-lit enough to permit photosynthesis by planktonic organisms, boosts potential biomass enormously, given sufficient nutrients. Maybe beginning the empire of the eukarya is interwoven with the first of our climatic paradoxes. Where they lived opens a window to yet more possibilities. Eukaryote life must first have extracted carbon by photosynthesis in the top layer of the ocean. The 2.2 Ga carbon-isotope excursion represents a change in that layer, for most limestones from which the data come formed in shallow water. The flattening of the C-curve at a δ13C value around zero in the billion-year long episode that followed implies a long period in which biological productivity and organic burial were balanced, though how is a puzzle unless oxidation by decay was somehow possible in the upper layers of the oceans. Upswings in δ13C around 2.2 Ga and 1000 to 600 Ma may have depended on the ocean bottoms being stagnant in the absence of whole-ocean mixing. Both Chapter 2 and sections of Part VI show that is not at all how the oceans work today, both in cold or warm periods. Stagnation encourages burial of dead tissue, for stagnant oceans develop oxygen-free depths with no chance of bacterial action converting dead matter back to water and carbon dioxide. Efficiently burying products of photosynthesis also builds up atmospheric oxygen, and so too ozone. How the oceans were set in circulation after the Precambrian so far escapes any conclusive analysis. Perhaps it stemmed from the melting of vast continental ice caps. Whatever, the fact that frigidity did not return for a billion years or more, and nor did massive carbon burial, may indicate a complete transformation in oceanic conditions from some previous state. The pattern of isotopic evidence for the late-Precambrian glacial epoch is much the same as for the earlier one. It coincided with a dramatic turn in life’s fortunes and awaits a chapter of its own in Part VI. Lest we become obsessed, as some are, with a notion that life is in the driving seat of Earth’s climate, remember the influence of powerful but slow tectonic processes. The late-Neoproterozoic Earth had recently possessed a peculiar supercontinent, Rodinia. Its relics, where found today are welded together by great belts of deformation that developed between about 1.3 and 0.9 Ga. The supercontinent was assembled by collision of previously isolated crustal masses in one of very few, truly global topographic unifications. It broke up over the period when Earth went ‘Snowball’ twice, between about 825 to 600 Ma. Though we cannot yet be so sure of a similar clumped mass for the earlier 2.2 Ga icehouse, its age coincides with many occurrences on all continents of deformed and metamorphosed rock. Some have proposed a Kenorland supercontinent that had formed at the end of the Archaean, but by the time of the 2.2 Ga ‘Snowball Earth’ it too was in the process of break-up. Supercontinents make ocean circulation simpler than on a world of island continents. When they disassemble surface- and deep currents continually change. Perhaps pan-continental collision is behind slumps into ocean stagnation, with continental break up a key to setting deep circulation in motion once more. However, the greatest influence of continents, as far as ocean chemistry is concerned, is that they supply dissolved products of erosion and weathering. Periods of mountain building and crumbling increase the supply of essential nutrients for photosynthesizing life. Glacial milling of rock does this wonderfully well too. It is plain that tectonics opens new potentials for life, and a large response by the biosphere may feed back to force the process further. But it is inner working, at mantle depths, that sets the agenda. What shapes the Precambrian mountains assumed, and how they modified the circulation of air and its redistribution of solar heat is hard to judge. That aspect of tectonics becomes clearer with younger climatic upheavals. Figure 17.3 Drifting continents of the Phanerozoic: (a) in the late-Cambrian (about 510 Ma); (b) in the early Carboniferous (350 Ma); (c) at the start of the Permian (260 Ma). Abbreviations: NA – North America; SA – South America; G-Greenland; S-M – Siberia + Mongolia; K – Kazakhstan; NC – North China; Sc – South China; Au – Australia; An – Antarctica; Ar – Arabia; SEu – South Europe; NEU – North Europe. During the Cambrian Period strontium supply from the continents to the oceans (Figure 16.2) began to wane compared with that from the ocean floor. This followed the steady Precambrian rise in the 87Sr/86Sr ration of sea water that culminated with formation of the late-Precambrian supercontinent of Gondwana (Figure 6.3). At the outset of the Phanerozoic Eon continental erosion and weathering either slowed down or more sea floor formed; probably a bit of both. Palaeomagnetic data show quite clearly that Cambrian sea-floor spreading split the preceding supercontinent into several island continents (Figure 17.3a). This new configuration provided plenty of possibilities for unique ocean current patterns, and plenty of time for the mountain belts to fall as no new ones were being constructed. Ocean circulation capable of reaching everywhere would have smoothed out the distribution of energy across the Earth’s surface. Despite the island continent that carried most of northern Europe being at high southern latitudes, the rocks there record no glacial deposits. Cambrian stratigraphy reveals that large tracts of the continents were awash, and shallow-marine sediments appear everywhere – in the Lower Palaeozoic sea-level rose to about 250 m above where it stands today (Figure 5.5). That tells us something about the pace of sea-floor spreading. For the seas to transgress the land required ocean basins to be shallower on average than in the late-Precambrian, implying that oceanic lithosphere was hotter and lighter as a result of faster spreading (Chapter 5). Flooded continental margins absorb solar heat better than does bare land, so we can suggest warmer times. Almost certainly, increased volcanism at oceanic rifts and also in island arcs generated higher CO2 emissions. With only oceanic living processes to draw down this ‘greenhouse’ gas from the air, its atmospheric level would have been higher than today. Estimates based on processes that supply and withdraw CO2 give about 18 times present levels (Figure 17.4a). This predicts efficient ‘greenhouse’ conditions that computer modelling converts to global temperatures 6-7°C higher than now (Figure 17.4b). Figure 17.4 Charting the Phanerozoic ‘greenhouse’ effect: (a) atmospheric CO2 levels modelled from varying input and withdrawal processes during the last 542 Ma (red-blue line); atmospheric oxygen (green line); ocean anoxia events – black bars. (b) Variation in estimated global mean surface temperature. All this continental wandering during the Lower Palaeozoic inevitably changed all manner of surface processes. The only one that we can see with clarity is, surprisingly for an apparently ‘greenhouse’ world, another glaciation. Around the Ordovician-Silurian boundary (~440 Ma) typical glacial deposits appear in South America and north Africa, but nowhere else. This too is a paradox, because everywhere else should have been warm, and their sediments confirm that. The southern continents had been drifting together as the Gondwana supercontinent since the late Proterozoic. If they reached high latitudes, the interior of such a mass, bigger than modern Eurasia, would have developed typical extremes of annual temperature. Once athwart the pole it would be completely isolated from ocean warming (Figure 6.2b) with no reason for it to profoundly influence the rest of the climate system (Part VI). 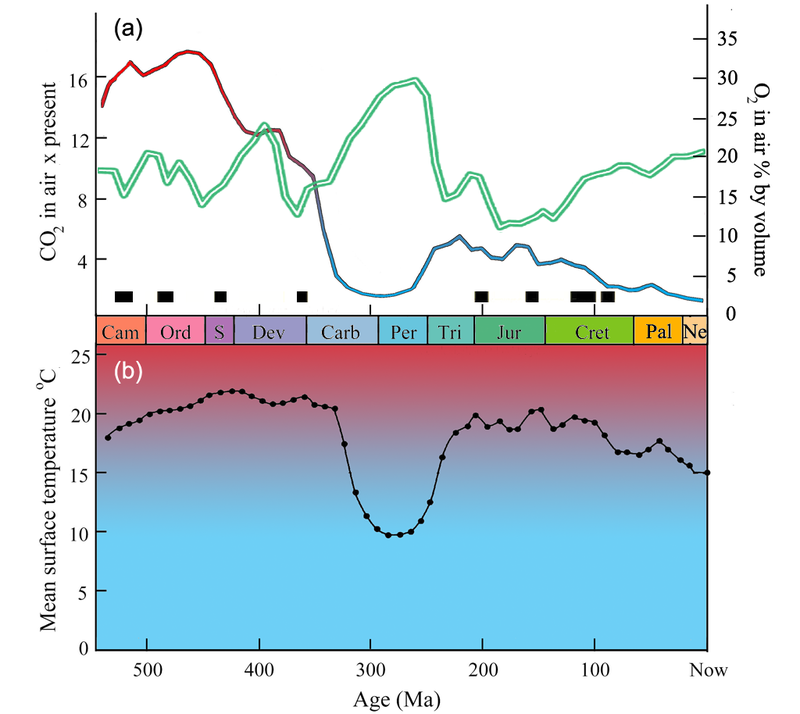 The record (Figure 17.4a) shows that CO2 began to fall during the Silurian, and continued to do so for about 100 Ma, into the Carboniferous Period. Two developing changes conspired climatically to cause this decline in greenhouse potential. Continents had begun to turn green once plants had established a foothold above sea level (Part VI) after emerging in the mid-Ordovician (~470 Ma), while land masses had begun to cluster together through repeated collision beginning at about the same time. Rising mountain belts and massifs quite probably similar to the Tibetan Plateau would have generated monsoons, perhaps eventually far more intense than today, to amplify weathering and the draw-down of CO2. By Devonian times more carbon would be able to enter vegetation on land, wherever sunlight, humidity and temperature permitted. Were any carbon to be buried on land before complete decay, a dual refrigerating pump would come into operation. This takes us back to Alfred Wegener’s discovery of the decisive evidence for his idea of Pangaea – when plotted on his reconstruction Carboniferous to early Permian glacial scratches all radiated outwards from a point (Figure 2.4b). By 350 Ma (Figure 17.3b) continents, though not yet annealed, had started to accrete to one another. By late Carboniferous times they formed a broad N-S swath crossing the equator. ‘Slice worlds’ (Chapter 16) are highly sensitive, and disrupt major ocean current systems. 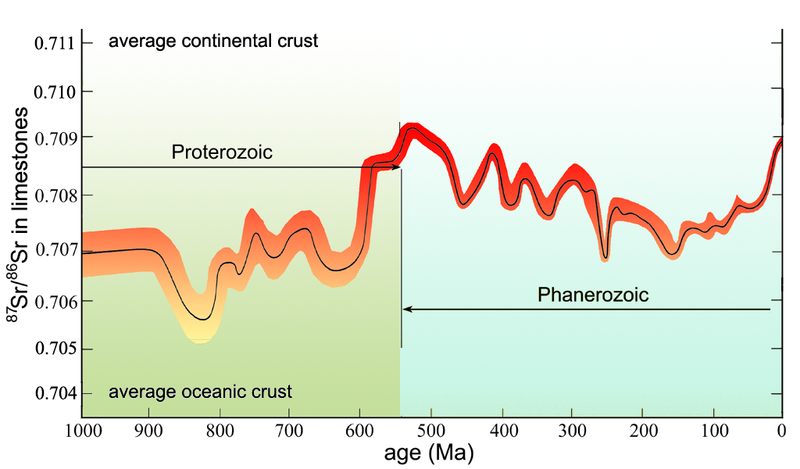 Sea level was falling rapidly during the mid-Carboniferous (Figure 5.5) to expose flat areas of earlier marine sediment around continental margins. There, basins to accommodate continental debris, including swamp vegetation, might and indeed did form, particularly where rising mountains bowed down the lithosphere to create topographic ‘moats’ around themselves. Falling sea-level over a broad span of time may be a sign of reduced sea-floor spreading and thus a fall in volcanic emissions of gases during the welding of Pangaea. For more than 50 Ma the net effect of all the factors fed on each other, to encourage and sustain a global fall in temperature. It resulted in the southern part of Pangaea experiencing glacial conditions. We have little direct idea of this ice-cap’s waxing and waning, for continental glacigenic rocks are ephemeral except for the very last to form, and any contemporary oceanic sediments disappeared down subduction zones long ago. But we do have the coal deposits, and they are most peculiar. Massive burial of swamp vegetation covered a period of almost 100 Ma, not as a few thick coals but dozens, even hundreds. Each seam records emergence above water level, and is separated from other coals by a repeated sequence of marine, estuarine and deltaic rocks, and then a soil. Such cycles were at first not easy to interpret. The repetition may have owed part to local sagging of the lithosphere beneath each area, and part to ups and downs of global sea level. Making some general assumptions about the rates of sedimentation involved, and mathematically analysing the varying thicknesses of the cyclic ‘coal measures’ reveals a mixed periodicity that coincided in several coal basins on different modern continents. 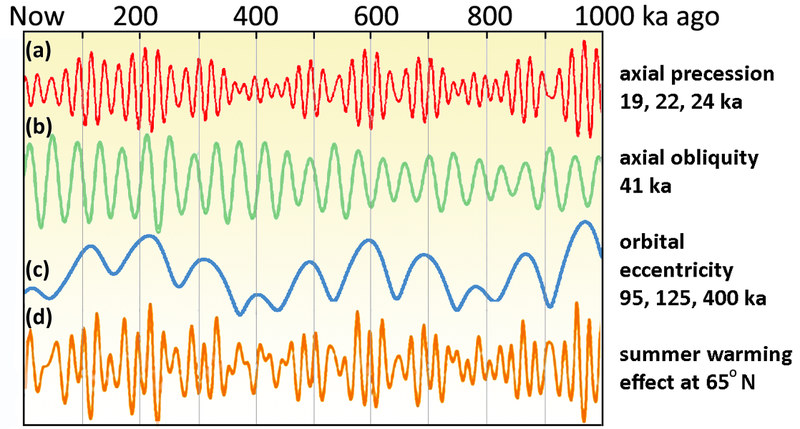 The fluctuations involved cycles of around 100 and 40 thousand years, which correspond to the faint astronomical forcing of climate due to changes in the Earth’s rotational and orbital characteristics (Figure 4.3). Again and again the planet went through cycles of glaciation and deglaciation very like those of the last 2.5 Ma about which we are far more certain. Other, planet-wide processes, conspiring to maintain coolness – dominated by the much reduced atmospheric CO2 levels – kept Earth locked in a climatic oscillation for more than 50 Ma. The Carboniferous and Permian witnessed the longest glacial episode of the whole Phanerozoic, and perhaps in Earth’s entire history (Figure 17.4b). How did the Carboniferous-Permian world emerge from rapid oscillations between climate extremes? This is a thorny question, because the main energy circulation, dominated by Pangaea’s blocking role to equatorial flow, remained and hindered low-latitude current flow well into the Mesozoic (Figure 17.5). Although break-up of the supercontinent began around 200 Ma ago, it was only seriously underway by the mid-Cretaceous. Sea levels did rise and fall during the Permian, Triassic and Jurassic Periods but not decisively until about 150 Ma ago (Figure 5.5). So there was no significant increase in sea-floor spreading and CO2 release by that means. There are two possible processes that may explain Earth’s escape from the Carboniferous-Permian icehouse: life in the early Mesozoic became less able to draw down the CO2 continually emitted by volcanoes; there was a tectonic shift which influenced climate and that fed rapidly into the rest of the system. The massive extraction of CO2 from Earth’s late Palaeozoic atmosphere, mainly by burial of terrestrial plant life, had another effect; photosynthesis produced a great deal of oxygen. Roughly coinciding with the long, Carboniferous-Permian ice age and the period of great coal swamps, atmospheric oxygen content rose by the mid-Permian to its highest (30%) in the entire history of our home planet. As you discovered in Chapter 8, the Carboniferous and Permian Periods saw gigantic insects, for whose rudimentary respiratory system the oxygen boost was a huge benefit. It allowed them to evolve to dominate coal-swamp ecosystems. But such levels of the most common oxidant are a chemical hazard and green vegetation may have spontaneously burned in huge wildfires. 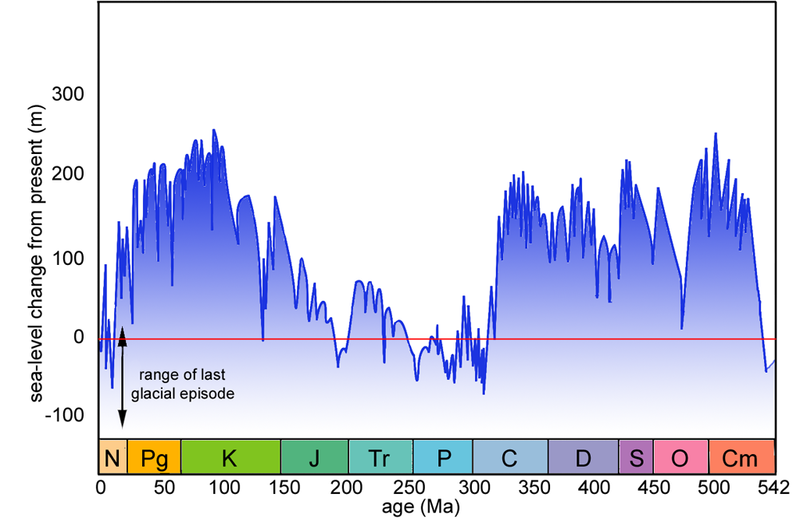 Between 250 and 200 Ma –the Triassic Period – oxygen levels fell as much as they had risen earlier (Figure 17.4a). By the early Jurassic the had fallen to the lowest level of the entire Phanerozoic (~11%), of which more later. That fall must signify a massive and protracted reduction in photosynthesis, allowing carbon dioxide levels to rise commensurately. The late Permian and Triassic also saw the continents become steadily more red as oxygen combined with iron to form the oxide grain coatings that impart their distinctive colour to vast tracts of sandstones and clays. Large areas were desert in the proper sense that little if anything lived in them. Wegener recognised that the South Pole – the focus for his radiating glacial scratches in the reassembled southern continents – lay within Pangaea during its glacial epoch. With an increasingly more widespread set of palaeomagnetic data at finer time intervals it has become clear that Pangaea shifted during the Permian to lie symmetrically across the equator. Both poles then lay in open water. This would have changed both ocean circulation and wind patterns. The coal measures laid down in the great tropical coal swamps are overlain by redbeds that indicate a swift drying out. Humid Carboniferous tropics gave way to desert conditions in the Permian, and this probably shows a shift to atmospheric circulation that no longer transferred so much moisture towards the supercontinent. Coals continued to form, but at much higher latitudes, which resulted in an unmistakeable decline in reserves in the Permian. High latitudes present less solar energy for photosynthesis. So it may have been this relatively small tectonic shift that massively reduced CO2 drawdown by plants. It could build up in the air once more, and ‘greenhouse’ conditions returned (Figure 17.4b). But at the end of the Permian, something far more dramatic occurred. Life on land and in the oceans came close to being extinguished. For perhaps 10 Ma there was little to prevent volcanoes amplifying the ‘greenhouse’ effect. As you will see in Part VI, volcanic action of the most catastrophic kind probably lay behind the mass extinction that brought the Palaeozoic era to an end. Throughout the earlier half of the Mesozoic era, sea-level rose slowly but steadily, despite a few hiccups on the way (Figure 5.5). By about 100 Ma ago it stood higher than at any time in the last half-billion years, as much as 250 m above its current level. 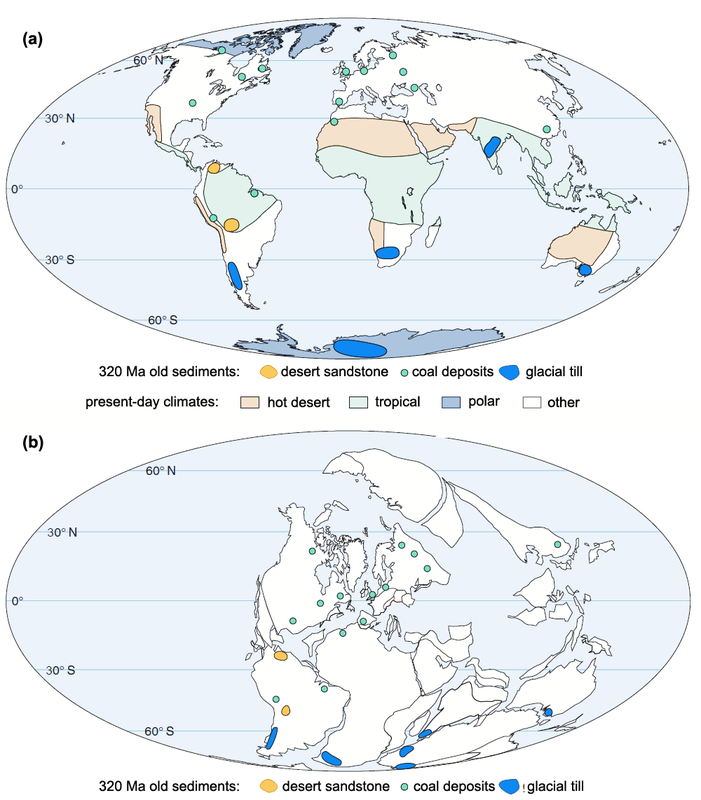 Marine sediments laid down in the mid-Cretaceous extend over much of the modern continents (Figure 17.5). Shallow seas that penetrated everywhere imply the spread of a moistening maritime influence, perhaps making much of the planet humid. The shallow inland seas would also have absorbed solar energy, stored it and through shallow currents, redistributed it. Gradual erosion of the mountain chains that trace Pangaea’s lines of assembly would have assisted this pervasive spread, by smoothing the continental surface. While continents were clumped together no collision could have thrown up mountains deep within the landmass. Although the spreading from oceanic ridges in the single great ocean would have thickened the supercontinent margins by adding magmas and shortening the crust, such zones are not barriers to inland seas. Only one major process can explain this mid-Cretaceous global inundation. The total volume of the ocean basins must have shrunk. That implies shallowing of the abyssal plains, in places by as much as 2.5 km, to displace so much water onto the land. Shallow seas, warmth, plenty of light in the tropics and planed-down land that supplied little mud to cloud the water provided great scope for marine organisms, given enough nutrients for the phytoplankton base of the food chain. The Mesozoic exploded with sea life in ever evolving forms. The most important in this context were those that secreted hard, carbonate body parts. By the mid-Cretaceous Pangaea had also begun to break up, first along a tropical seaway allowing circum-equatorial currents to flow. The former fringes of this Tethys Ocean (Figure 17.5) record huge thicknesses of limestones, built mainly in Cretaceous times – ‘factories’ for carbonate deposition by a variety of organisms – both animals and marine phytoplankton. They are not reefs in the accepted sense, for those only grow as vertical barriers when sea-level continually rises and falls, as in the last 2-3 Ma. Stable or slowly rising sea-level, together with slow subsidence of the shallow sea floors allowed shelly life to spread far and wide and to lay down huge volumes of calcium carbonate. Slightly deeper water saw yet more limestone manufacture in the form of the famous white Chalk cliffs of south-east England and northern France, which also spread across Europe to the fringes of the Urals. In them few fossils meet the naked eye, but a microscope reveals Chalk to be made almost exclusively of tiny carbonate plates secreted by planktonic single-celled algae. The Chalk is a product of highly productive phytoplankton blooms. Animal plankton with shells, called foraminifera (forams for short), also exploded in the Cretaceous, and contribute to other limestones, such as those from which the Pyramids are built. These carbonate factories beg a simple question, where did all the calcium and bicarbonate ions come from? By now you will see this as partly a rhetorical query, for the last must be from a CO2-rich atmosphere. The calcium is not so easy, requiring weathering of feldspar in rock, and not a lot of erosion went on in the Mesozoic compared with earlier and later times. Burial of limestone on such a scale and at a fast pace, must surely have drawn down from the air the main player in this global greenhouse. But the laying down of carbon does not stop with shelly remains. A warm planet finds it extremely difficult to circulate water to the deepest ocean bed, for water everywhere is warm and buoyant, unlike today when cold dense brines sink from polar regions (Figure 2.2). Tropical evaporation allows some circulation of its residue of warm dense brines. But warm liquids dissolve very little oxygen gas, especially when its atmospheric level was so low from the Jurassic to mid-Cretaceous (Figure 17.4a). For long periods deep water would have been almost free of oxygen, and therefore of any biological processes that can oxidise dead tissue completely back to water and CO2. Earth’s appetite for burying carbon knew few bounds at the height of the Mesozoic greenhouse, and bacteria-infected muds steeped in rotting tissue built the source for the world’s largest petroleum reservoirs around Tethys. Burial and geothermal heating of the resulting black oil shales partly ‘cracked’ this lugubrious debris. It became fluid enough to float on water retained in the sediment pile to invade younger, higher sands and porous limestones that now supply more than half world supplies (Chapter 7; Figure 7.2). All this withdrawal of carbon, yet no cooling of the Cretaceous world, demands a continual resupply of CO2 to maintain its climatic forcing effect. There is another aspect of carbon burial, particularly that of rotted tissue. Ultimately its source is photosynthesis that converts water and CO2 to carbohydrate, and that generates oxygen. The Mesozoic burial of carbon, especially in the Cretaceous period, began to raise the oxygen content of the atmosphere (Figure 17.4a). 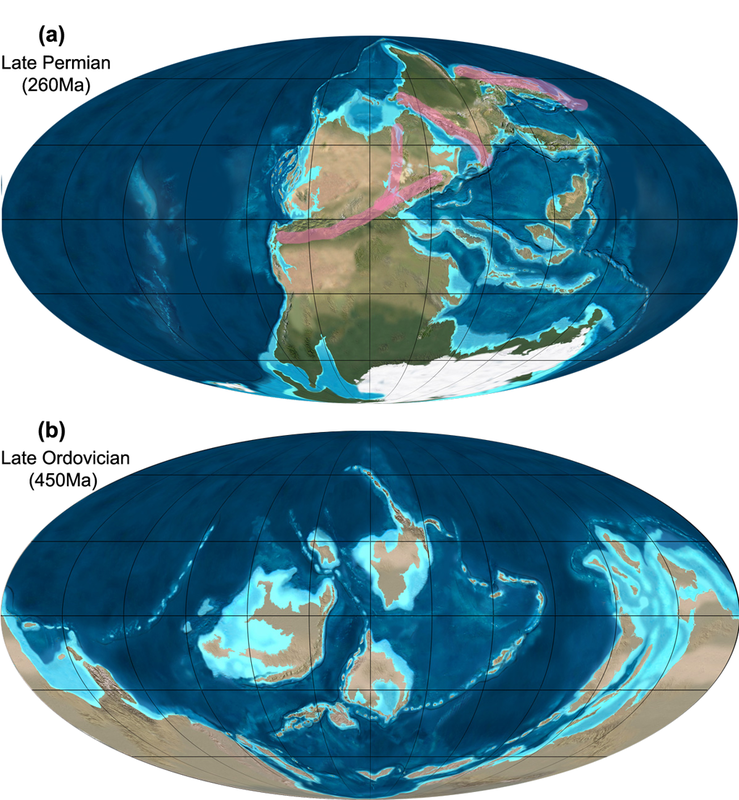 The general rise in Mesozoic sea level coincides with increased sea-floor spreading. Beginning in the Triassic, Pangaea split and its component parts drifted apart. 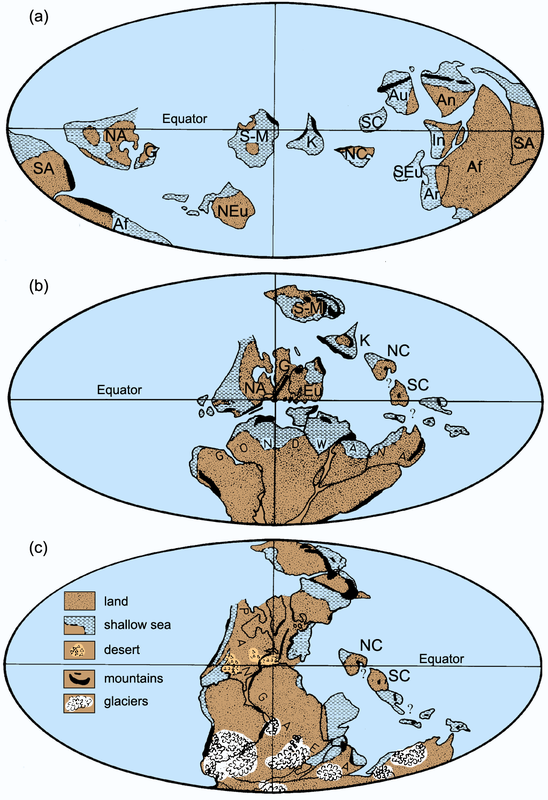 Except for a few oddities, such as an island India and Australia and Antarctica clinging together as the last remnant of Gondwanaland, Figure 17.5 begins to bear some resemblance to the modern planet. So a continuous and accelerating production of new oceanic lithosphere may lie at the root of the Mesozoic greenhouse. Yet warming, flooding and carbon burial peaked at 125 Ma ago. Until 1989 this remained a mystery. That year Roger Larson of the University of Rhode Island was involved in drilling an area of the western Pacific, suggested by general principles of plate tectonics to be floored by Jurassic (145 – 200 Ma) lithosphere. After many years of puzzling results in an area the size of the USA – all previous samples were of Cretaceous basalt ranging from 80-120 Ma – in 1989 the drill bit deep enough to show Jurassic oceanic crust beneath Cretaceous basalts. For sea-floor spreading, that relationship should have been sideways not vertical. 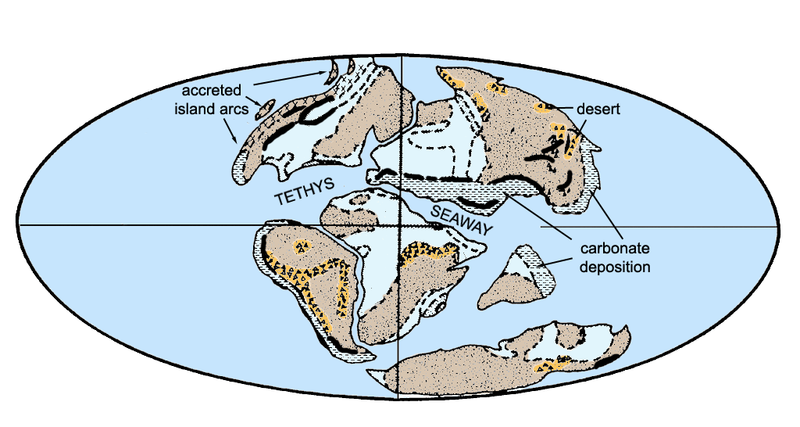 Larson grasped that this large area of ocean floor (rugged with curious knolls and seamounts, and including the large, submerged Ontong-Java Plateau; Figure 7.1) had resulted from basalt outpourings that had no connection with sea-floor spreading. Larson postulated a mantle superplume, hitherto only suspected to have been connected with continental flood basalts, whose impact with the base of the West Pacific lithosphere had induced massive melting and heating. As above the much smaller plumes of modern Iceland and Hawaii, the buoyancy associated with high temperatures would have bulged the erupting flood basalts above sea-level to vent gas directly to the atmosphere, as well as adding to displacement of ocean water onto the continents. The timing of the cluster of seamounts and plateaus of the West Pacific coincides with the mid-Cretaceous magnetic superchron (Figure 5.3), so the superplume may reflect a protracted major event in the Earth’s core and lower mantle. This ‘bottom-to-top’ thermal and mechanical connection provides a means to account for both the huge rise in Cretaceous sea-level and warming, which contradicted massive withdrawal of ‘greenhouse’ gas from the atmosphere by carbon burial during oceanic anoxic events. Weathering of feldspar in the new ocean-floor lavas would also have provided abundant dissolved calcium eventually to be precipitated by organisms as carbonate shells in the carbonate factories. This huge overturn of the mantle lasted perhaps 25 Ma. Once it had waned, new processes worked on the climate. We evolved and live in what became a world with an unstable climate about 34 million years ago. A climate becoming so unstable that since about 2.5 Ma even minute changes in solar heating brought on by shifts in the gravitational influences of far-off giant planets brought about abrupt shifts from spreading to shrinking of continental ice sheets (Part VII). Averaged out through these upheavals, our world became about 5° C cooler and developed drier conditions on land than those enjoyed by the dinosaurs, and sometimes it is very much colder and drier. Most of the life that surrounds us evolved since the end of the Mesozoic Era. Because of this, questions of when, how and why the Earth‘s climate shifted to form a backdrop to biological events in the Cenozoic are especially interesting. That geoscientists have made substantial progress in charting and understanding the rise of the contemporary world from the thoroughly alien one of the late Mesozoic is thanks to the preservation of much of the ocean floor generated in this last 66 Ma. Far from shore it is blanketed by oozes that accumulated from a continuous rain of carbonate shells secreted by foraminifera. As I briefly explained earlier, and expand on in Part VII, temperature governs the relative transfer of different isotopes of oxygen from water into shell carbonate. But directly measuring surface-water temperature using that phenomenon is not so easy at it might seem. When water evaporates there is much the same relative transfer or fractionation of oxygen isotopes into atmospheric water vapour. When the entire mass of the atmosphere’s water vapour falls as rain or snow that melts – that takes only 9 days on average – its fractionated isotopes re-balance the proportions in sea water. But when evaporated water ends up stored in continental ice for much longer periods it preferentially drags the lighter 16O from ocean water. That upsets the direct use of oxygen isotopes for judging sea-surface temperature. Perversely, the relative proportions of 18O to 16O (δ18O) in the shells of surface-dwelling, planktonic forams yield temperatures that are lower than they actually lived in. 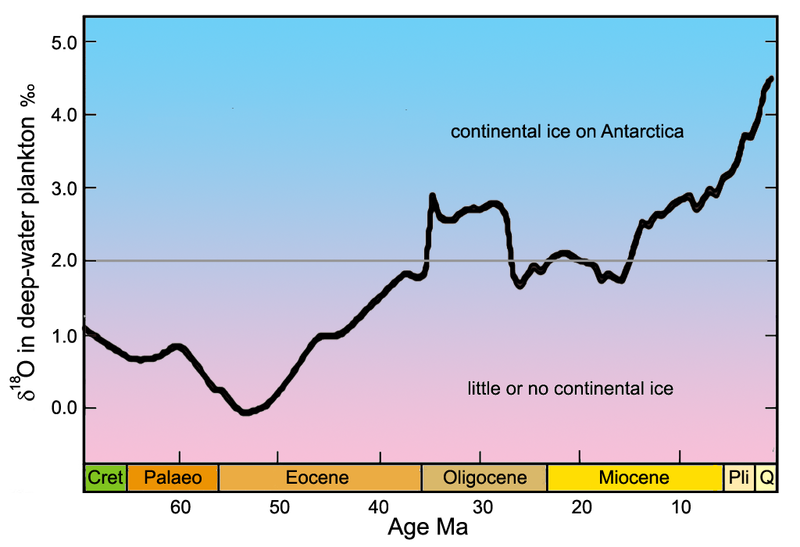 The magnitude of this apparent error depends on variations in the volume of continental ice sheets, which δ18O may also be also used to estimate. Separating the temperature and icc-volume record of any ups and downs in continental ice cover preserved by the planktonic forams. Benthic forams, on the other hand, live in the abyssal depths where bottom-water temperature changes only by a few degrees over very long periods – little use for tracking climatic shifts directly. But benthic foram δ18O yields a close approximation to changes in continental ice cover. Immensely useful itself in studies of ancient climate, benthic δ18O also helps correct data from planktonic forams to give accurate estimates of past sea-surface temperature. Figure 17.6 shows the changing δ18O in benthic forams that lived and died over the last 70 Ma in water at the bottom of the Atlantic Ocean. From a Cenozoic minimum value in the early Eocene δ18O increased to about 4.5‰ by the Quaternary. To achieve that change a huge mass of light oxygen-16 had been extracted from ocean water and that suggests a commensurate increase in the amount of glacial ice locked-up on land. Quite probably there have often been small glaciers on high mountains at any latitude, but at the Eocene-Oligocene boundary, about 34 Ma ago, a sharp increase in δ18O marks rapid growth of huge glaciers, almost certainly on Antarctica. Sediment cores from the seabed around Antarctica show the equally sudden appearance of diamictites at that time. In fact from 34 Ma onwards glacial debris is found in all cores from the Southern Ocean floor. Estimates of changing atmospheric carbon dioxide, partly from changes in the number of respiratory stomata on fossil leaves, link the onset of a stable ice cap on Antarctica to a drop in atmospheric CO2 below 600 parts per million. Figure 17.6 Variation of δ18O in Atlantic deep water forams during the Tertiary. Shunting so much light 16O into continental ice takes an awful lot of evaporated water. The growth of the Antarctic ice cap to its present volume is equivalent to a worldwide sea-level fall of 60 m. So, the δ18O record provided by benthic forams is also a proxy for sea-level fluctuations. On the timescale expressed by Figure 17.6 glacial and global tectonic influences on sea level are obscured, but as you will see in Part VII, on the short time scales involved in our origins, evolution and conquest of the planet, sea level and climate were in lock-step. Antarctica reached its polar position in the Cretaceous, yet from the Cretaceous through to the Oligocene Epoch the south polar continent was widely forested. A high-latitude is clearly not enough to set massive glaciation in motion. Somehow the heating for Cretaceous and Palaeogene ‘greenhouse’ conditions was turned down. That requires a reduction in the ‘usual suspect’, atmospheric carbon dioxide content. The ~34 Ma episode of climatic downturn began with CO2 levels falling below 600 ppm. For the previous 200 Ma (Figure 8.1) it had been far higher, between 1000 and 2000 ppm. The end-Eocene draw-down was extremely rapid, with a loss of between a quarter and a third of atmospheric CO2 in only a million years. That implicates a tremendous boost to both global photosynthesis and to carbon burial in one way or another. Glacial debris also appears in marine sediments of the North Atlantic, but the Northern Hemisphere had in fact preceded Antarctica in developing high-latitude glaciers, at around 44 Ma in the Eocene. The glacial debris probably came from Greenland, near to the sampling site, and lasted in the local sea-floor record until 30 Ma, when it disappears. Ice-rafted debris turns up on the bed of the Greenland Sea again around 14 Ma, the gap matching the dip in the δ18O record (Figure 17.6). Thereafter ice accumulation at high latitudes in both hemispheres accounts for rising values to the present day. Yet there are no signs of true ice-age conditions establishing themselves at lower latitudes than the Arctic Circle until around 3 Ma ago, when global cooling intensified dramatically, launching its most spectacular effects in the Northern Hemisphere. Around that time, the Ice Age, in which we live during one of its peculiarly warm spells, had begun. After the pandemonium of the mid-Cretaceous superplume, volcanism and the rate of sea-floor spreading waned. There were outbursts of continental flood basalts at around 66, 60 and 30 Ma ago, in western India, the North Atlantic region and NE Africa respectively that would have boosted CO2 levels. At about 55 Ma a protracted rise in mean global temperature, coinciding with the Palaeocene-Eocene (P-E) trough in the δ18O record, is difficult to explain through volcanic emissions. A well supported hypothesis is that it resulted from destabilisation of deep-water sediments and the strange ice-like substance or clathrate that forms in them because of low temperature and high pressure. Chemically, these can be described as gas hydrates, which combine methane, carbon dioxide and water. Vast amounts are known to exist from their curious signature on seismic reflection profiles employed during exploration for far deeper petroleum reserves. How such destabilisation happens is not well known, but the 2 teratons of methane implicated in the P-E temperature rise – methane is a much more powerful greenhouse gas then CO2 – could easily have blurted out from the huge reserves that are known. Normal processes of carbon burial would themselves have come to balance with various supplies to the atmosphere, including the continual volcanic supply, to give some cooling since the last of these major perturbations, but not enough to match that observed in the palaeoclimate data. On a more uniformly warm planet, oceans currents would have been much more sluggish without thermohaline circulation of cold, dense brines (Chapter 2). Calculations suggest that a two-fold increase in ocean circulation would be sufficient to account for all Tertiary cooling, but the issue is not how much circulation there may have been, but where it took place and how the carbon burial happened. 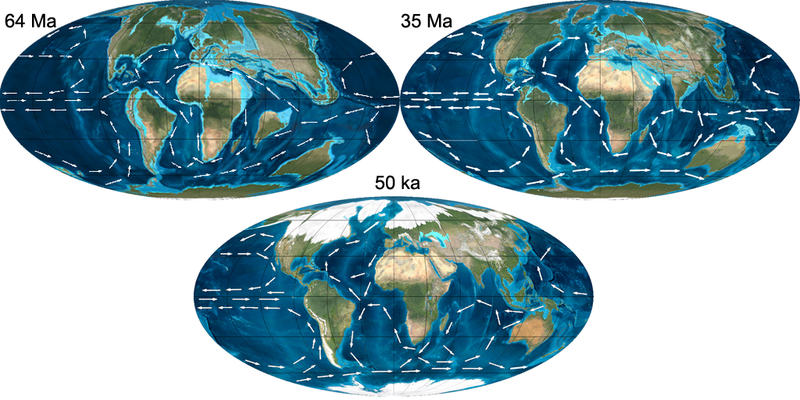 Figure 17.7 shows three snapshots of palaeogeography with models of ocean-current flow, at the start of the Cenozoic, the Eocene-Oligocene boundary and in the run-up to the last glacial maximum. Continental positions on Figure 17.7 do not show much obvious difference except for India’s journey from attachment with Africa to final collision with Eurasia and the creation of the Himalaya. While the Tethys Ocean and the seaway between North and South America existed, powerful westward wind and current drift at the equator transferred heat to polar regions. Once Tethys closed as a major seaway at about 17 Ma that influence would wane, but the decisive geographic shift to affect Antarctica’s fortunes was quite minor by comparison. Around 35 Ma ago, South America parted company with its polar companion to open up the Drake Passage. That set in motion the high-latitude, eastward circumpolar current in the Southern Ocean, which effectively cut Antarctica off from warming influences. A recent hypothesis is that once such a powerful current and wind circulation around Antarctica started, upwelling of cold, deep water increased the nutrient supply to the Southern Ocean and the biological productivity of its surface waters. This and organic carbon burial would have increased the extraction of atmospheric CO2; oceanography, tectonics and the biosphere as climatic agencies. In fact, it is highly likely that the Antarctic ice cap itself became an active participant. Its high albedo reflects most solar heating and its effect on topography – eventually lifting the South Pole to 3 km – changes atmospheric circulation to give further cooling. Once the grand coalition of factors was in place in the Miocene Antarctica’s ice cover steadily increased. Another geographic change with oceanic influences out of all proportion to its size is revealed by comparing Central America on the 35 Ma and 50 ka reconstructions of Figure 17.7. Until 3 Ma ago, when the Americas became united across the Isthmus of Panama, the Atlantic and Pacific oceans were connected, so that warm currents and moist air circulated equatorially. Once they were barred, Atlantic circulation took on its present form, driving warm water and a source of moisture for atmospheric circulation northwards to the Arctic. The last is crucial for the growth of northern ice caps, but more of this in Part VII. With the final closure of Tethys around 17 Ma, Africa and India had also collided with Eurasia to throw up the Alpine-Himalayan mountain chain. Accelerated erosion and weathering, as you saw in Chapter 16, works to draw down CO2. The strontium isotope record of the Cenozoic (Figure 16.2) suggests a relentless rise in the amount of continental weathering, most of which stems from the new mountains of Eurasia plus those on the west coast of North America. Those new mountains lying athwart global wind belts also worked to divert air circulation. The north-south chain of western North America blocked warm, moist winds from the Pacific and allowed the southward spread of the dense polar air mass in winter. The Himalaya and Tibetan Plateau, as well as strengthening the Asian monsoon, allowed winter air from the Arctic to spill into central Asia. Cenozoic plate movements therefore united in two different major influences over climate, a general decrease in the atmosphere’s ability to absorb solar energy, plus major changes in how that reduced energy was distributed across the face of the planet. Large-scale processes underlain by those in the mantle go some way to explain general cooling through the Cenozoic. But the main characteristic of its course is of sudden changes. As you have seen that which established permanent ice cover on Antarctica seems to have been oceanic in origin. The event that presaged the appearance of tool-making humans between about 3.0 to 2.5 Ma ago is the onset of unstable continental glaciation in the Northern Hemisphere, which further cooled global climate. Changed Atlantic circulation after the Americas joined, together with continued spreading of the North Atlantic between Greenland and Scandinavia, redistributed warmth polewards with the forerunner of today’s Gulf Stream. That provides a good explanation for a supply of water vapour to feed glacial growth. But there is a paradox here. Resolving it requires looking at how snow can build year on year to form ice caps, remembering that once established they look after themselves to a large extent, by reflecting away incoming solar heat. They need a ‘nursery’. Deeply gouged as they are by successive glaciations, the sites where northern continental ice sheets formed reveal a clue. Any energetic visitor to northern Scotland will undoubtedly try to bag a ‘Munro’, a peak higher than 914 m (3000 feet), and there are many to choose from, but few that rise above 1200 m. Without glacial erosion to form the sweeping Scottish glens, most of its landscape would be a plateau around a kilometre high. The same applies to much of western Scandinavia, the Arctic islands of Canada and Labrador, and would too in Greenland were it not still bowed down by the mass of ice still remaining on it. All these areas receive snow in winter, often great thicknesses, but today it generally melts away except for small patches and on relics of the former ice caps. This plateau rim to the North Atlantic is not some coincidence. At 60 Ma ago it was awash with flood basalts emanating from a mantle superplume, that left their most visited relics on the Hebridean islands off north-west Scotland. Such plateau basalts are common in east Greenland too. The mantle plume still bashes on in Iceland, to buoy it up above the general depth of the ocean floor. That plume initiated the first rifting of a 500 Ma old landmass to open the North Atlantic, and its influence remains in the plateau rim. Careful study of the landscape and Tertiary sedimentation shows that the uplift had a second boost a matter of 20 Ma ago. This created the nursery for the huge Northern Hemisphere ice sheets that rampaged southwards again and again during the last 2.5 Ma. Understanding how glaciers form is easy. Once winter snowfall exceeds summer melting, ice may become permanently established. The first signs are banks of snow that last year in, year out. They signify the snowline, which can be plotted out today. At elevations about 200 m above this, glaciers will form. This is not a matter of elevation or temperature alone; how much precipitation falls as snow is equally as decisive. At present if any of Scotland’s hills were higher than 1450 m they would possess small glaciers, with the present winter snowfall, that is. Were snowfall to increase and be maintained then the elevation limit for glaciation would fall to coincide with most of the high peaks. For the seaward, western side of Scandinavia, the ‘glacier line’ is lower, and lower still for Spitzbergen, Greenland and the Canadian Arctic. Given that increased snowfall, then the self-preservation of highly reflective ice further drives down the elevation limit. Ice mass increases and under gravity it begins to flow, spreading its influence. Clearly this is a matter of great climatic sensitivity. It always snows in Scotland, Scandinavia and the rest of the Arctic rim. The issue for glacial growth is largely how much falls set against how much melts. The North Atlantic ice-sheet nursery brackets the latitude where summer warming by the sun fluctuates most in the Northern Hemisphere, according to the combined effects of 100, 41 and around 20 thousand-year astronomical cycles (Chapter 4). As you will see in Part VII, that small, regular perturbation has been enough to roof the Northern Hemisphere in ice with almost metronome regularity.